But the rest of the media (BBC, Yahoo, CNN, MSNBC) reported a very different story than what really happened, vilifying the children. However, their lies are now exposed. It's all on video. 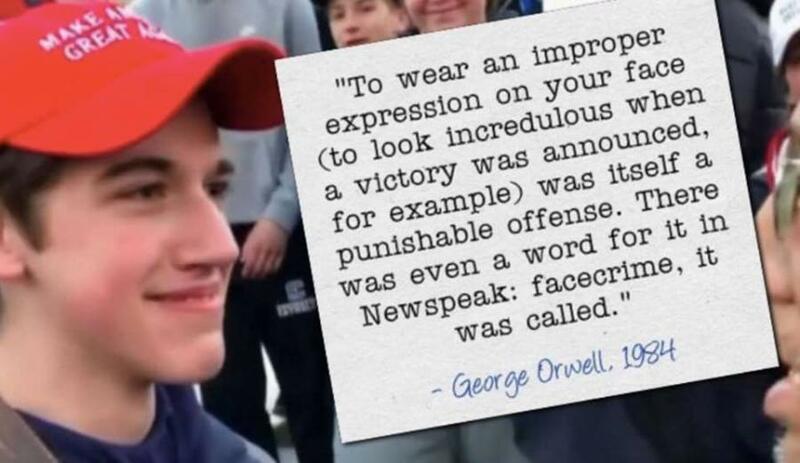 I've written a letter to the principal of the school the young man attends (Covington Catholic HS in Ky.) and asked for leniency (reasonable punishment if needed). When I had gone to the school website there was a message on it that the school was considering expulsion for the young men. Today is King's holiday so the mail won't go out until tomorrow. Watch the whole video, he didn't do anything but smile. The only ones that should be punished are the adults who were harassing those kids. Leftist are such despicable garbage. The red MAGA hat is the new white hood. Without white boys being able to empathize with other people, humanity will continue to destroy itself. This fake news was a major story on NBC's nightly hatefest a few days ago. And no evidence was provided in the footage shown, mostly just that kid looking at the Indian. Wearing the MAGA hats made all of them guilty of something they didn't do. It may have been the same broadcast that also showed a prom couple with their right arms thrust outward in a playful way. And a couple of other pictures of White kids doing the same, including trotting out that high school picture from Wisconsin a couple years ago. BTW, NBC's nightly news is almost the same every night -- two or three completely biased attacks on Trump, and several segments focusing on race -- always from an anti-White perspective -- and/or stories with a feminist slant. I would say feminist propaganda has now surged ahead of the racism racket as a tool the communists find most effective as it strikes at the very heart of the traditional family and healthy, balanced relationships between men and women. ABC and CBS are similar. That's one of the defining characteristics of Amerika -- the sheep are seemingly offered endless choices but all are variations of the same one. The hate-filled lesbian who made the Gillette commercial is more and more typical of the people who now dominate the media. They network and work in tandem like a hive to hire and promote their own kind exclusively. Their numbers increased significantly in the House of Representatives last election; Alexandria Ocasio-Cortez is the most well known but she has a group of comrades she will be raising hell with. Instead of the "swamp" being drowned, the enemies of Middle America have doubled down in every conceivable way and still have no opposition beyond Trump's tweets and taunts. And tweets and taunts mean nothing when you control all the institutions of power other than the White House, and even the Trump administration is crawling with swamp creatures and banksters. Turns out Nathan Phillips is NOT a Vietnam war veteran, or any kind of war veteran - he was never deployed into a war zone. He told reporters he served in Vietnam in 1976 -- US withdrew in 1973. Ha ha. I figured odds were he wasn't a Vietnam vet. What a dumb lie that can easily be checked. I've run across numerous dubious Vietnam vets and often the giveaway is their age. This guy is no more a Vietnam vet than Eiizabeth Warren is. Good for that kid! Stand there white and proud and let the indian know that you are white and proud. Glad he didn't let that nutcase bully him. Glad to see more and more whites doing stuff like this and also exposing the media for their biased reporting. 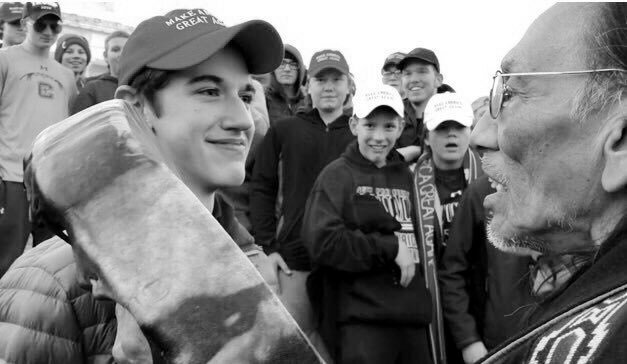 Notice how the mainstream media only shows closeups of the young white man and the Indian provocateur? That's lying by omission. They omitted all the information to make it seem something it wasn't. What is amazing about this story is that the people that were so enthusiastic about the original fake news have continued to cling to the narrative despite the release of new information. Read the comments at any story and the original haters have not moved on inch. That's how rigidly polarized this country is. I hear Trump is going to invite the kids to the White House. A small thing but another reminder of how different the world is with Trump as President. Some in the conservative media are soft pedaling the racial aspect of this incident. The white teens were subjected to racist abuse from the blacks and the Indians. Some in the conservative media are suggesting the main problem was the MAGA hats. It was that the victims were white. I was just thinking this morning about how the Looney Left has no clue of what they have become. Someone should have given that redskin a bottle of “fire water” & told him to stay on the reservation in his teepee (& stop shilling for the Zionista vermin). It’s a pure D fact that the heathen “injuns” did NOT found this Constitutional Republic or make it great...that was solely via the White man! Excellent video! The anti-whites hate it when white men don't back down. It's been reported that he wasn't even a veteran. The left lies like crazy. Our society’s fervid “hunt for the Great White Defendant” is the central insight of Tom Wolfe’s 1987 novel The Bonfire of the Vanities. The supply of white wrongdoing falls short of demand, so our culture offers rich rewards to those who can concoct instances of whites behaving badly. Upton Sinclair observed, “It is difficult to get a man to understand something when his salary depends upon his not understanding it!” Not surprisingly, many in the Democratic-media complex misunderstood the video of the besieged boy acting classy as yet more evidence of the white wickedness for which they hope to be rewarded for uncovering.